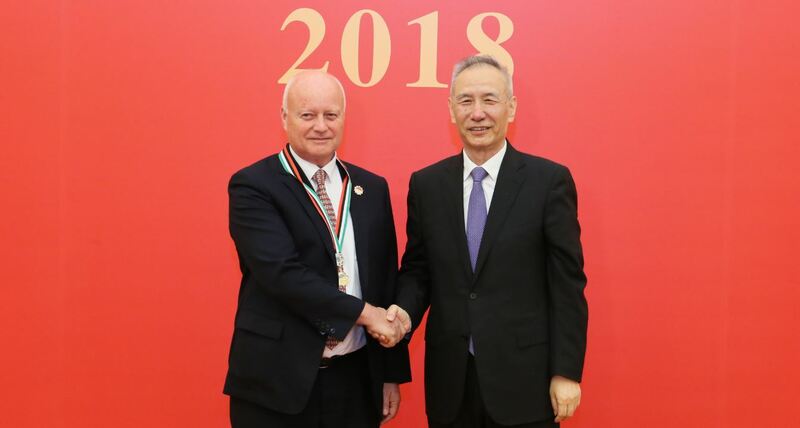 Charles Jeremy (Jerry) Brown, CEng, MIMechE, BSc (Mechanical Engineering) 1982, PhD 1986, received the Chinese Government Friendship Award at a special ceremony in the Great Hall of the People in Tiananmen Square, Beijing, on 29 September. Originally from Larne in County Antrim, Jerry was presented with the medal by H E Liu He, Vice Premier of the State Council of The People's Republic of China and was also invited to meet the Chinese Prime Minister Li Keqiang, the following day. Established in 1991, the Award is China’s highest honour for ‘foreign experts who have made outstanding contributions to the country's economic and social progress.’ This year 50 experts from 21 countries were recognised. Vice Premier H.E. Liu He, a member of the Political Bureau of the Central Committee of the Communist Party of China, met with the 2018 laureates and their relatives to thank them for their active contributions to the economic and social development of China. He pointed out that after 40 years of reform and opening up, a large number of foreign experts came to his country, and China’s long-time experts had joined the Chinese people in the modernization drive. Jerry Brown is a leader in the marine communications industry and an international expert in the subsea cable industry. In 2014 he joined Hengtong as Chief Engineer attached to Jiangsu Hengtong Marine Cable Systems Ltd. Since then, new breakthroughs have been made in the field of submarine cables and scientific research capabilities have been enhanced. All new cables are tested and qualified for a design life of 25 years and are compatible with the Universal Jointing technology. On 30th September, Premier Li Keqiang met personally at the Great Hall of the People with the foreign experts and their relatives who had won the 2018 China Government Friendship Award. Jerry and his wife attended the Li Keqiang general meeting and a further reception to celebrate the 69th anniversary of the founding of the People’s Republic of China. Li congratulated the foreign experts who won the prize and spoke highly of their important contributions to the economic and social development of China and to the exchange of experience in various fields between China and foreign countries. He extended warm greetings through them to all foreign experts working in China and their relatives and said this marks the 40th anniversary of China’s reform and opening up. Queen’s has been developing strategic partnerships in China for more than two decades and currently there is a vibrant Chinese community of over 600 students at the University. Over the last 10 years, Queen’s has invested over $10m in China-related research in areas such as sustainable energy, food security and cancer research and during the past five, staff of the University have co-authored 807 research publications with 184 Chinese Partner Institutions. In 2017, a group of UK Russell Group Universities led by Queen’s, set up a partnership – the first of its kind – with the top nine engineering institutions in China, in a bid to build major collaborations aimed at building higher education links and helping to improve the quality of engineering research and teaching in China. 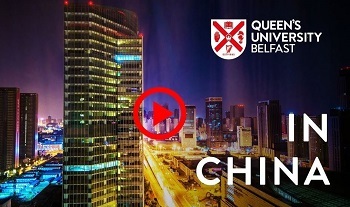 Find out more about Queen’s University Belfast’s connections with China here or by clicking on the video above.